NEWS: Laughing all the way to The Duke's - Lancaster. The Dukes latest groundbreaking project for people living with dementia promises to put a smile on their faces. 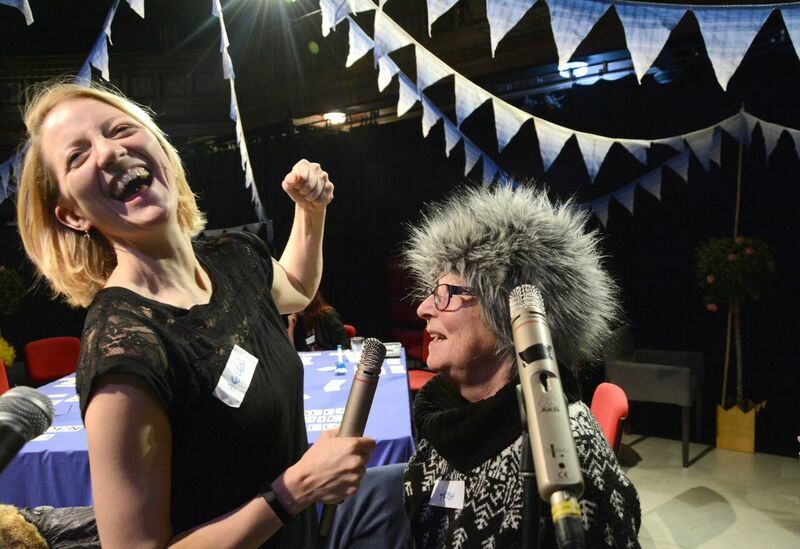 Bring Me Laughter follows on from The Dukes pioneering A Life More Ordinary (ALMO) programme of dementia friendly events and is funded by Wellcome’s Public Engagement Fund. The idea for the new project was sparked by the success of ALMO’s Still Me multi-arts group which focused on creativity, imagination and fun. The Dukes proximity to Morecambe and all its comedy connections is a factor in the project too as many people attending ALMO sessions had memories of seeing comics in the resort. Although music has long been acknowledged to stimulate memories for people with dementia, the power of laughter is yet to be explored so The Dukes hopes to be a pioneer in this field, inspiring future research. A professor of dementia studies and a neuroscientist, both from University College London, will monitor the effects of laughter on the people involved. The project will explore how laughter and playfulness can be used to develop stronger social connections and better communication with people living with dementia and their carers and help to understand how the relationship between play, laughter and the development of rapport impacts on the daily life of those involved. Bring Me Laughter will include dementia friendly film screenings and activities that encourage play through music, dance, drama, visual arts and poetry. Training and creative sessions will take place in Lancaster, Morecambe and Carnforth as well as care homes and a carers guide will also be produced. It is planned that primary school children will be involved with some of the activities too. The project will culminate from May 21-23, 2020 with a three-day festival at The Dukes featuring performances, workshops, lectures and displays open to people with dementia and their families, health and care professionals and artists as well as the general public. “Bring Me Laughter is a big project covering innovative ground and we hope to have some fun along the way,” said Gil. NEWS: Family Fun guaranteed at Liverpool's Epstein Theatre this coming season! A trio of much-loved children’s picture books come to life with the highly anticipated productions of Room on the Broom; The Very Hungry Caterpillar Show; and We’re Going on a Bear Hunt. Expect songs, laughs and scary fun for the whole family when the Olivier Award nominated stage show Room on the Broom comes to the Hanover Street venue Tuesday 30 April – Thursday 2 May. Join the witch and her cat on their mission to defeat the dragon in Tall Stories’ magical, musical adaptation of the classic picture book by Julia Donaldson and Axel Scheffler. Then, Eric Carle’s timeless tale The Very Hungry Caterpillar makes its way from the page to the stage on Sunday 19 – Monday 20 May. The critically acclaimed production features a menagerie of 75 lovable puppets, faithfully adapting four of Eric Carle’s stories, Brown Bear, Brown Bear, 10 Little Rubber Ducks, The Very Lonely Firefly and the star of the show The Very Hungry Caterpillar. The smash-hit production of We’re Going on a Bear Hunt make a joyous return to The Epstein Theatre direct from the West End on Sunday 30 June – Monday 1 July. Based on the much-loved picture book by Michael Rosen and Helen Oxenbury, expect catchy songs, interactive scenes, plenty of adventure and a few surprises along the way. Have a roar-some time at the hit stage show So You Think You Know About Dinosaurs on Sunday 5 May. Go on an exciting pre-historic adventure with dinosaur aficionado Dr Ben Garrod and discover all about the deadliest predators that ever roamed the planet in this interactive, educational and highly entertaining show. Immersion Theatre are back at the Epstein with The Amazing Adventures of Pinocchio, a brand-new musical adaptation of the classic tale on Tuesday 28 May. This magical and high energy musical is packed with comedy, audience interaction, and a host of new songs guaranteed to have audiences singing along. This jam-packed family season is guaranteed to be a smash hit with audiences and are certain to sell out fast, be sure to grab your family’s tickets to avoid missing out on these spectacular shows! Tickets: Standard £13, Family £47, Groups (10+): £10 & 1 in 10 free. For more details check out www.epsteinliverpool.co.uk and join our mailing list. Follow us on Facebook www.facebook.com/EpsteinTheatre and twitter @EpsteinTheatre. NEWS: Let It Be cast become "day trippers" to Liverpool ahead of new tour! After a successful Autumn 2018 tour, Let It Be: A Celebration Of The Music Of The Beatles goes back on tour with its updated show for Spring 2019. The new UK tour opens next Tuesday (23 April) in Portsmouth, before visiting Inverness, Glasgow, Aberdeen, Blackpool, Bath, Bradford and Norwich. Ahead of the new tour, the cast were invited to the birthplace of The Beatles to officially launch a recently unveiled new mural of Abbey Road, to celebrate the 50th anniversary year of the release of the album of the same name. The Let It Be cast are Emanuele Angeletti (Paul McCartney), Richard Jordan (John Lennon), John Brosnan (George Harrison), and Ben Cullingworth (Ringo Starr). They donned their Abbey Road costumes to recreate the iconic album cover pictures. The public interactive artwork can be found in the city’s quirky Baltic Triangle area, it was specially commissioned by visitor attraction The Beatles Story located at Royal Albert Dock Liverpool, and created by acclaimed Liverpool artist Paul Curtis. After a costume change into their smart Beatles suits, the Let It Be ‘Fab Four’ then embarked on the Long And Winding Road round Liverpool city centre to visit Beatles landmarks – where they caused quite a stir! The four Day Trippers visited The Beatles statue on the Liverpool Waterfront, part of the city’s UNESCO World Heritage Site, before making their way to Mathew Street – the scene of many iconic moments in the band’s history. The Let It Be cast commented: “What a privileged to be invited to Liverpool to launch the Abbey Road mural by Paul Curtis and The Beatles Story, it was a magical moment for us to be part of. Visiting Liverpool, the birthplace of The Beatles and where it all began in their incredible history, was very fitting as we head towards the start of the new tour. The Let It Be tour is made possible by West End producer Mark Goucher and Canadian producer Jeff Parry, a huge Beatles’ fan who created the show. The Let It Be cast Emanuele Angeletti, Richard Jordan, John Brosnan, and Ben Cullingworth are joined by musical director Michael Bramwell on keyboards. They all play and sing live throughout the show, which is described as a theatrical concert. Act One takes audiences through the early days of the band as they embarked on their musical journey and onwards to the heights of globalBeatlemania. The first half of the evening features many of their most famous songs including I Want to Hold Your Hand, Day Tripper, Sgt Pepper’s Lonely Hearts Club Band, Penny Lane, A Day In The Life, Come Together, Get Back, and The End. Audiences are taken on a memorable and unique step back in time to the reunion concert taking place on 9 October 1980 – it’s John Lennon’s 40th Birthday. This is the ultimate concert that never was. Just imagine: the band reunites for one night only. The band’s solo material featured includes Starting Over, Band On The Run, Black Bird, Got My Mind Set On You, My Sweet Lord, Live and Let Die, and Imagine. The updated show was given its UK premiere in Autumn 2018. The new show proved such a hit with audiences and critics alike that a sell out European Tour followed. 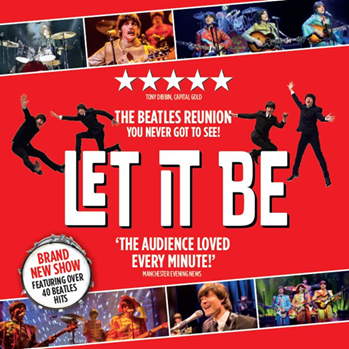 Let It Be: A Celebration Of The Music Of The Beatles Is different in its approach that it allows audiences to capture the show by taking photographs and video throughout the show, encouraging them to snap and share on social media, using the hashtag #LetItBeLive – extremely unique for a stage production. 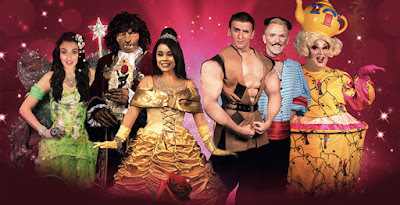 REVIEW: Beauty And The Beast - The Plaza Theatre, Stockport. Mother and daughter duo, Jane Joseph and Chantelle Nolan set up Regal Entertainments Ltd, 25 years ago. Since being based at the St Helens Theatre Royal, Regal Entertainments have produced 3 seasonal pantos every year. Their panto version of 'Beauty And The Beast' came to Stockport as the highlight of the Plaza’s Easter programme. Loosely based on the popular Disney cartoon classic, this enjoyable and enchanting production provided perfect entertainment for young families. Pantomimes are synonymous with Christmas and watching this show on one of the hottest days of the year was to begin with slightly disconcerting. A spirited opening however quickly got me in the panto mood as did the arrival on stage of all the main characters. Of these Sarah Walker as the kind-hearted Fairy Rose and Kiera-Nicole Brennan from Channel 5’s, 'Milkshake', as the beautiful and good natured Belle, quickly struck up a rapport with the audience. Funny man Lewis Devine, as French Frank, in only his second pantomime, proved to be an instant hit with audience goers of all ages especially when involving a couple of them unwittingly in his comic capers. Dispelling with embellishments, this version of 'Beauty And The Beast' quickly got to the heart of the story. In order that her odious son, Gaston may marry Belle, the villainous Madame Botox, poisons Prince Benedict turning him both in and outside into a Beast. Rescued whilst escaping from wild wolves, Belle is given shelter in the Royal Palace where she meets and eventually falls in love with the Beast. Add some large, well-staged musical numbers and a number of well known slapstick scenes, such as, “Busy bee, busy bee, what have you got in the hive for me?” and this playful yet touching version of 'Beauty And The Beast' has all the ingredients of a sure fire panto hit. The small company of principal performers, supported by an enthusiastic troupe of juvenile dancers worked extremely hard to bring out both the comedy and pathos in Liam Mellor’s script. Occasionally with some of the innuendo, I felt that it crossed the boundary of what is acceptable in a family show of this type, to what extent this was the writer’s or the performers' doing was unclear. The strongest performances were given by Brennan as Belle and Andrew Geater as The Prince/Beast. Both sang with clear, confident voices and gave detailed character performances. Their exquisite rendition of Cyndi Lauper’s ‘True Colours’ was a real highlight and showcased their musical theatre pedigree. As already mentioned Devine as the leading comedian provided some genuinely funny moments especially when cavorting on stage with Si Foster’s Dame Potty Polly. Philip McGuinness as Garston and Hannah Moncrieff as Madame Botox were suitably camp and villainous as the panto baddies and clearly relished playing their roles. Directed with flair by Chantelle Nolan and slickly choreographed by Sarah Walker, this panto scored highly on good production values and in spite of using backing tracks, the musical numbers throughout were sung and staged to a very high standard. Although I am generally used to seeing pantomimes in the lead up to Christmas, I would happily see another of Regal Entertainment's pantos performed at any time. ‘Dragged Across Concrete’ is the third feature from writer / director S. Craig Zahler who, in 2015, brought us ‘Bone Tomahawk’ the cult western which (ahem!) separated itself from the rest of the genre’s fayre with a moment so shocking, audience members would have done well to hold on to their breakfasts. His follow up, 2018’s ‘Brawl In Cell Block 99’ is equally gathering fan buzz and judging from the title, is probably not going to appease audiences eagerly awaiting the next series of Call The Midwife. ‘Dragged Across Concrete’ has a title befitting exploitation or grindhouse cinema and its trailer promises wit, hard-boiled detectives, violence and ski-masks that prompt comparisons to the crime classic ‘Heat’. It is the tale of two cops (played by Mel Gibson and Vince Vaughan) who are suspended from active duty without pay despite making a successful bust, because a civilian filmed them on a mobile phone as they used excessive force on the drug dealer that they were taking down. Faced with six weeks without pay, at a time in their lives where they really need money to better their personal circumstances, the partners hatch a plot to shakedown a criminal who is in town and up to no good. As they stalk their quarry, it becomes apparent that these men don’t know what the crime is that they’re going to intercept and profit from, and that they have underestimated their opponents. The film introduces many sympathetic and three-dimensional characters, so that the tension builds steadily as we watch their stories converging towards the as yet, unrevealed criminal plot. In the first two acts Zahler creates a crime thriller that steadily cranks the tension so effectively it borders on becoming a horror film. Gibson and Vaughan are well cast as the bickering cops with a jaundiced outlook, even if their character arcs demand little range from either performance, whilst Tory Kittles as Henry ‘slim’ Johns, the small-time hood unable to return to the straight and narrow after his release from prison, elicits more sympathy through a nuanced performance. Despite feeling that the film could afford more pace, it is undeniable that it holds you in its grip like you’re a cable-tied hostage, wide-eyed and breathlessly awaiting the inevitable outburst that your captor is clearly building up to. But this film makes you wait for it, instead building character motivation through conversations in cars, diners or apartments. One conversational scene strikes me as a real mis-step because it featured Vince Vaughan happily extolling the problems of saying something racist which, if caught on film, means you’re branded a racist for life, whilst Mel Gibson (y’know Mel – filmed spouting anti-semitic nonsense whilst blind drunk on a roadside DUI stop and calling the police officer sugar***s - Gibson. Yeah THAT Mel Gibson!!!) snorts agreeably with him. The audience are positioned with uncomfortably right-wing protagonists with no explicit signs of irony, so be warned. 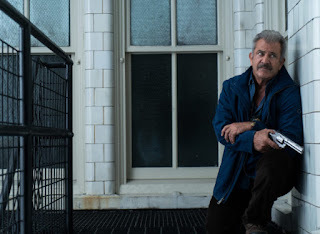 I can be critical about the pace, or the ideologies on show, but ‘Dragged Across Concrete’ is compelling stuff for two thirds and when the final act places all of the story components together in one arena setting for a final showdown, you’re practically rubbing your hands together in nervous expectation. But sadly, it never fulfils its promise. Having introduced villains who are superior in numbers, skill, weaponry, planning and cruel single-mindedness, Zahler completely fumbles their impact. The climax has so much potential in the chosen location, in the physical placement of characters, hell it even makes detailed and explicit references to objects (both through camera shots and repetition of dialogue) that could ramp up the ante, but they get discarded. There are moments of tension that equal the tense build up to Heat’s astonishing LA gun battle, or set ups that are reminiscent of Ben Wheatley’s gleefully bonkers ‘Free Fire’, but Zahler bypasses their potential. By the time the film has limped to its anti-climax, its hard not to feel a little let down, having been promised so much. The final coda makes a call-back to an earlier scene as though what the character says sums up his behaviour in the film… and it is puzzlingly nothing like what he did. It is also such an improbable epilogue, which looks like a Kardashian cheese-dream, that it completely defies logic. The film’s title ‘Dragged Across Concrete’ cannot be taken literally, but along with the inclusion of aged-stars in need of rehabilitation, it implies some serious B-Movie credentials and promises some abrasive and gnarly shenanigans will ensue. Unfortunately, it doesn’t live up to its name. As I emerged from Cinema 4 of HOME, I could only think of this cheap summary: I bought a ticket for ‘Dragged Across Concrete’ and boy did I get my money’s worth. There was a lot of concrete and the final act really dragged. REVIEW: Orpheus Descending - Theatr Clwyd, Mold. I had fond memories thinking of my own acting journey starting out with the Clwyd Youth Theatre whilst I headed over to Mold in North Wales to watch Tennessee Williams’ Orpheus Descending. The play opened on 15th April at Theatr Clwyd and runs until 27th April. I can say with heartfelt passion that this Menier Chocolate Factory and Theatr Clwyd co-production certainly packed a punch and had me leaning in for more and more from my comfy Welsh theatre seat. Once I set foot into Theatr Clwyd my first thoughts were taken immediately to the space itself and how much it had grown and developed over the years, whilst still keeping its original charm. It indeed had been a pivotal place with my own performing there as a young and aspiring actor and I could tell straight away that this was a theatre that means business! The production shall be transferring down to the Menier Chocolate Factory, an off-West End theatre in an intimate space, for an 8-week run from 9th May. The popular London theatre as its name suggests is actually set in an old chocolate factory (I have lovely visions of chocolate aromas still in the air) and produces its own plays, musicals and comedy. Without giving too much away, in Orpheus Descending, a young charismatic musician, Val, played by the very alluring Seth Numrich, descends on a small, repressive Southern town and forms a relationship with a passionate, yet unfulfilled woman, Lady, played by Hattie Morahan. She is trapped in a bad marriage and has somewhat of a heart-wrenching past. This production exhibits and tackles many of the playwrights typical subjects head on: loneliness and desire, sexuality and repression, the desperate longing for freedom. It touches on suppressed feelings, passion, and all this in a sometimes harsh, cruel and bigoted world. There is also violence that as an audience you can feel bubbling away under the surface. The two leads played their parts beautifully. Numrich a charming and seductive Val, who I’m sure stirred the souls of a few audience members with his almost dangerous charisma. Morahan I felt really wore the skin of Lady and I believed in her, along with the inner torment and unfilled passion. The play is wonderfully poetic and with many tender moments of humour. I, along with a packed out audience were fully invested in the story, which is quite a wordy one and you do have to fully commit to some active listening. The Deep South accent work has to be commended from the actors and I’d say was pretty faultless throughout, high praise for Penny Dyer and Nick Trumble, the voice and dialect coaches. There was an atmospheric mood throughout. The set design although simplistic in its nature was striking and for me enough. Perhaps a personal thing, but I do prefer a naturally stylised set, no frills, where I can fully concentrate without distraction on the story in hand, however what made this design from Jonathan Fensom even more effective was the clever use of mood lighting and the wonderfully emotive musical and sound choices. I especially loved the night-time crickets that helped evoke my feelings of being transported to another world. Nothing overbearing, and credit to Gregory Clarke and Simon Slater for their musical input. The other point I would make on the set is that the floor level stage did seem quite vast, there was a lot of open space out there and with the powerful intensity of some of the scenes I wanted the space to ‘close in’ on the actors almost, especially the duologues to give them even more power. I think this production would also lend itself perfectly to an intimate, almost studio style space. The whole cast connected with each other brilliantly, and for me there wasn’t any one actor who was the weakest link. They often entered through the exits/entrances in the auditorium as they made their way up and down the stairs. I think a good decision as you have a great appreciation of being a part of the story, you are up close and personal with the actors which is exciting and always keeps an audience on their toes. Other stand-out performances for me were from Valentine Hanson, who plays Uncle Pleasant who’s energy and stage presence was electrifying at times. Although not a huge role, he was integral to the whole performance and such an interesting actor to watch. Also Jemima Rooper who played Carol Cutrere, a wild, feisty little thing and who performed her role (as an aside one that has always been on my own wish-list to perform) with great passion and heartfelt tenderness. Even as a wanton woman it is indeed that softness, the need to be touched and held that deep down she craves. For me a great tragic character to play. I could feel her pain, her brokenness, her anguish and my maternal instinct kicked in, as at times as I just wanted to scoop her up and take her away and hold her myself. A big shout out for Rooper from me! The rest of cast were all hugely outstanding in their own rights and I would strongly encourage a visit to see Orpheus Descending at Theatr Clwyd, or indeed when it transfers to London at the Menier Chocolate Factory. I am confident that you’ll be glad you did. REVIEW: Visitors - The Coliseum Theatre, Oldham. Set in a farmhouse in contemporary Dorset, ‘Visitors’ is an interesting piece which at first glance seemed comparable to some of the modern Irish plays such as ‘The Beauty Queen of Leenane’, exploring intergenerational relationships in a confined rural setting but fortunately was nothing like as depressing, although certain dark undercurrents were explored. The set of a farmhouse interior was very convincing as the play opened to show an elderly couple conversing whilst living out a quiet retirement. With not a single electronic item in site (not even a radio) but plenty of varnished woodwork and pottery in evidence, the scenario was well depicted of life from another era still present in today’s world, juxtaposed to that of a young woman with died blue hair in dungarees who arrives to spend time there. ‘Visitors’ is primarily about generational differences, in terms of outlook, attitudes and aspirations. The later appearance of the couple’s son, a smartly dressed man in his forties, completed the triangle of three generations with it transpiring that he was going through a divorce. The outward appearance of each generation seemed to be a metaphor for their attitude and life styles; the young woman trendily dressed and open-minded about life and her future (a true millenial? ), the middle-aged man in a sharp suit, career-minded and opportunistic whilst the old couple wore dowdy clothes, appearing never to have expected much (the husband revealing he was the third generation to living in the same house which is all he had ever known). On the face of it, the set-up might have seemed very clichéd, with the old couple representing a time when divorce was very much the exception in contrast to their son’s generation, where his wife had simply ‘got bored of him’. 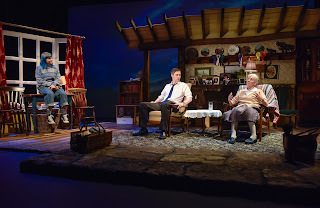 However, there was considerably more depth to the play as the story unfolded with a lot of well-written dialogue which had clearly been in part based on real-life observation (the young writer Barney Norris has stated that much of the source material for the old couple came from his own grandparents). The play in many ways questioned what have passed for modern values and offered some hope in that the new young generation just might be that bit more caring and less cynical than their parents whilst it was clear from the old couple that a lot had been lost through the rejection of many of their old-fashioned values, not least of which was simply learning to be content with what you have. A side-issue to the play was the on-set of dementia in the old woman, a stark reminder that this is very much a growing problem across Western society, whether living in an isolated farmhouse as she was or the city, and it was the young woman who seemed to have the better recognition of this as opposed to the son whose remedy was just to pack his mother off to a care home. ‘Visitors’ was very well cast with Liz Crowther and Robin Herford very credible as the aging couple whilst Kitty Douglas as Kate brought an air of the fresh vibrancy of youth. Ben Porter looked suitably out of place, besuited in the old farmhouse and convincingly brought over a different attitude and mind-set to his parents. The play was directed with a good pace by Chris Lawson although it seemed rather odd why the large screen backdrop to the set kept continually changing. At times, the representational images, such as sky or a cornfield were clear enough, but having several changes within a single scene just seemed confusing. A good play, well presented and more observational of life in general than having a specific story. Certainly thought-provoking and well worth seeing. ‘Visitors’ is on until 4th May. REVIEW: Parsifal - The Minster, York. REVIEW: Closer - Hope Mill Theatre, Manchester. REVIEW: Kingdom - HOME, Manchester. REVIEW: Chicago - The Met Theatre, Bury. REVIEW: Hair - The Palace Theatre, Manchester. REVIEW: Bouncers - Waterside, Sale, Manchester. REVIEW: Two 2 - The Met Theatre, Bury. REVIEW: The Noises - The Old Red Lion, London.